Today we ordered two new fire engines to replace two front line apparatus. From drawing to fighting fire is approximately 8 months, we will keep you posted up to delivery. This pumper will be very similar to our newest (engine 4) but will feature an EMS compartment in each side with exterior access to accommodate our ILS equipment. Summary: The 2019 budget includes $572,000 to replace a 22-year old fire engine from 1997 with 135,000 miles on it. Currently, the Fire Rescue Department operates five engines from four stations serving approximately 37,000 residents over a 25-square mile geographic area. The replacement engine is proposed to be purchased from Global Emergency Products using the Houston-Galveston Area Council Purchasing Cooperative, a national joint- purchasing cooperative. The Fire District will contribute its share of the engine purchase, roughly $269,000, relieving some burden on Village finances. 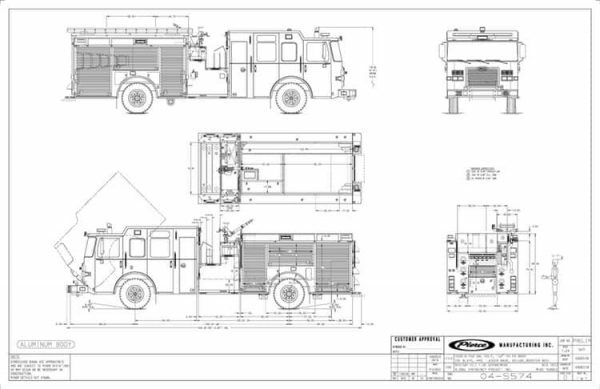 Recommended Action: A motion to authorize the purchase of one 2019 Pierce Saber fire engine from Global Emergency Products in the Amount Not-to- Exceed $539,214.